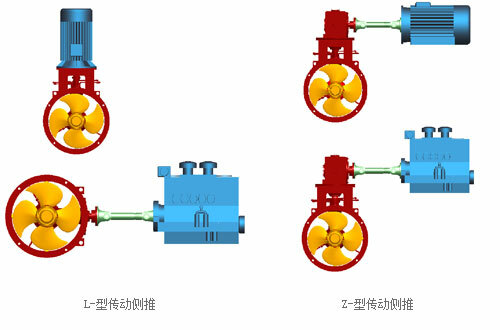 NGC tunnel thrusters are fallen into NCT controllable pitch propeller type and NFT fixed pitch propeller type, normally including prime mover, hydraulic system, remote control system and thruster itself. The prime mover is usually electric motor; sometimes, it also could be the diesel engine or hydraulic motor, and it can work under S2-30, S2-60 and S1;the remote system can connect Joystick and DP interface. The thruster itself can be transformed to be retractable configuration when coupled with the hydraulic cylinder. To be simple and high efficient is what NGC follows after during the designing of our thrusters. 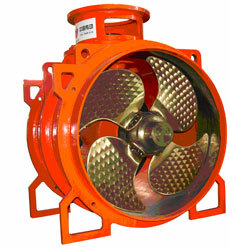 To make parts easy to maintain and interchange is our quality assurance to the whole package of tunnel thrusters. Large skewed propeller blades increase the blade ratio, and reduce the probabilities of cavitations, noise and vibration to the large extent; reasonable blade tip clearance improves the propulsion efficiency significantly. The bevel gears are designed and manufactured to Class ISO-4 in house, which could satisfy the requirements of different input speed; the arrangement of bearings with long service life and high precision ensure the gear meshing accuracy. Reliable material: blades and hub are produced with high strength Ni-Al bronze, and the drive shaft and gear are made of high quality alloy steel. NRT series retractable tunnel thrusters are the transfiguration of NGC CPP and FPP type Tunnel thrusters coupled with hydraulic cylinders. Under a certain work condition, it can stretch out of the hull to provide forward or side thrust to the ship. Normally they are mounted in the fore middle part of the ship, and they are retracted back into the hull during normal navigation. 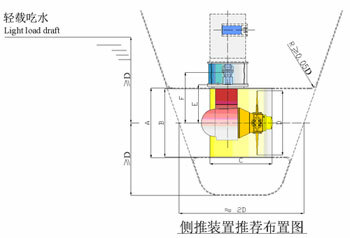 When the propeller is upside, it can be used as the tunnel thruster together with the pipe tunnel; when the propeller is underneath, it can be used as a temporary azimuth thruster with 360掳rotation. They are widely used in the oil tanker and ocean platform work boat.